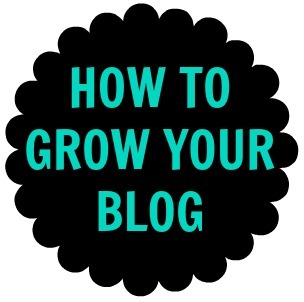 How to grow your blog- Part 1 - C.R.A.F.T. I started a discussion at the C.R.A.F.T. Community on Blog Frog about blog growth. I often get emails from other bloggers about this very topic. Questions like: What is the best way to get new followers? How did you grow your blog? Is Twitter really necessary? That kind of stuff. Today, I want to share what has worked for me to hopefully save you some time and energy..
Sticking to a schedule makes readers come back for more and helps you stay on topic. My schedule is loose but I consistently blog Monday through Friday…Monday is Making Monday Marvelous Tuesday-Friday I post craft/ diy tutorials or round ups. They are always related to what is happening in my life at the moment. When I get an idea for a post, I start a new post immediately, create a title, and save as a draft. That way every time I open my dashboard, I see the idea and don’t forget. I have a minimum of 10 drafts, and 10 scheduled posts at any given time! Start a facebook fan page and twitter account for your blog immediately. It’s easy and free. Use networked blogs so that every time a post is posted to your blog it automatically goes to your facebook and twitter accounts. I try and interact at least once a day on C.R.A.F.T. 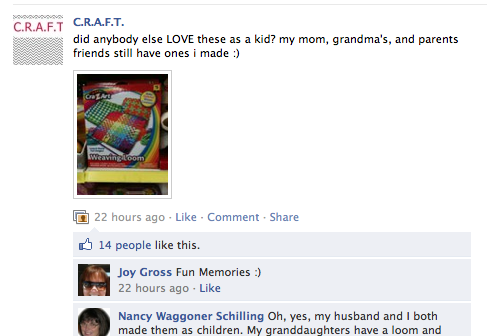 facebook…I really enjoy these conversations. Sometimes it’s just asking for an opinion on a project or even just, “what’s for dinner?” or posting a picture of the old school plastic weaving loom and reminiscing about the good ol’ pot holder making days! I linked up to THIS list of parties every. single. week. for a good 6 months. Being persistent is something I’ve always been good at…the squeaky wheel gets the grease, right ? Keep linking up, and you will get featured! Exposure was key for C.R.A.F.T. Once people know how awesome your blog is, they’ll come back for more! It never hurts to ask 🙂 C.R.A.F.T. has done a ton of blog swapping over the past 16 months. Blog swaps are a win- win! Rachel @ One Pretty Thing features a TON of crafts–email her and let her know about your projects! I’ve also had good luck with submitting projects to Apartment Therapy and Craft Gossip. Here are 2 things that will instantly make your blog better, in my humble opinoin. Turn off your music and turn off your word verification for comments. This will get you more comments! Post it somewhere on your blog. After all, it’s the law! And meet up with other bloggers. Comment on other blogs, go to conferences (loved bloggy boot camp), and set up blog dates with like mined ladies in your area. It’s FUN and good for your blog! Whether your blog is business now or you want it to be someday…carry these with you all the time. You never know when blog talk will begin. Here are the very first business cards I made out of cereal boxes. Update: I made new business cards! Hope this was a helpful list. As always, if you have questions…email me at [email protected]! I’ll do my best to help you out! p.s. if you want to know more about getting sponsors, I always direct people to this post from Little Miss Momma! What great ideas! I'm new at the whole blogging thing so thanks for posting. This post is fantastic and SO helpful because I'd really like to grow my blog into something more than it is. I actually just started doing Twitter yesterday and I've pondered doing a facebook page but do you think there's a certain size you need to be before that's effective? Love this post! So many great ideas!!!! I just wanna say THANK YOU for this. Great tips. SO SO TRUE. It was extremely kind of you to put it out there for newbies trying to learn the ropes. I couldn't have said it better. I may be a fairly new blogger but every single thing you mentioned works. SO thanks!! Also, I tried to share your link on my FB page (Happy Baby Designs) but it flagged it as "abusive" material!?! I sent a message to dispute it so hopefully it will get corrected. AMEN to #7! Didn't know about #8! Great post! This is so helpful! Thank you for posting this. This is great stuff, Jamie! Thanks for sharing so many great tips – I had no idea about the disclosure statement either. Thanks for this. Very informative. I just transferred 4 blogger blogs over to wordpress and now I have to grow everything all over again. Ugh…but I don't regret it. Fortunately, they were relatively new blogs. Anyway, I'll definitely check out the things you listed that I'm not currently doing. I'm so happy y'all found this post helpful 🙂 Does anyone have anymore good ideas I left off the list? i'm no expert, but sounds to me like you got all the points! Thanks for sharing this! I'm new to blogging and am looking for all the help I can get! I already Twitter. And I love Pinterest! Did you know you can have a "follow me" blinkie for Pinterest?? I don't do any DIY, just make cards and scrapbook pages, but I love to browse blogs. I am amazed at all the creative ideas! Thank you so much for posting this Jamie! I am a new blogger and I love reading advice from the seasoned veterans. What a helpful post! I have a new blog and was wondering what is the next step to grow it. I mean, I love to make things, but it takes time to blog and so having readers would be nice. Sort of reinforcing my craft addiction… I am going to read your tips until I memorize them! thanks! Great list of pointers Jaimie! I could not agree with you more about linking up. Consistency IS key! I started linking up consistently to a long list of great weekly memes. I became very committed to this back in December. Well, June of 2010 my blog was getting 3,000 pageviews per month. June of 2011 my site is getting 26,000 pageviews per month. My top ten referring sites are all sites that I link up to every week. Thank you so much for this post. I've learned so much. Love your blog btw.Thank you so much for this post. I've learned so much. Love your blog btw. Jamie! I love this! Thanks so much for taking the time to put these together. They are so helpful and I will be coming back to look at these as I try to improve my blog. What GREAT advice from a seasoned blogger to a newbie! Thanks so MUCH for compiling this…off to read more now!